For some reason I have found the discussion of saving at the grocery store to be a touchy one. Especially if you have the audacity to propose that it IS possible to buy healthy food without spending a fortune. There were quite a few strong reactions on facebook the other day when I said this very thing. I’m not sure why this is, but I hope to change that, or at least bring some hope to those who want to do the best they can with what they’ve got. When I jump into the topic of buying healthy food without going broke, I want to make sure that one thing is very clear. While I will not address the government’s dietary guidelines (I do not deem those to be healthy), I do want to address what is in this statement. I really do not think that eating a diet of processed foods is cheaper than eating a whole foods based diet, and I’d really like to show you how our family of 8 has been able to follow this diet while staying on a very small budget. What you choose to do with this information is up to you, but please know I am not judging you or anyone else. If you choose to adopt these new habits and see how you might be overspending at the grocery store, I think you could be pleasantly surprised. If you’re going to read into everything with an attitude of, “I can’t do this because…”, well, then you will probably continue doing what you always have. 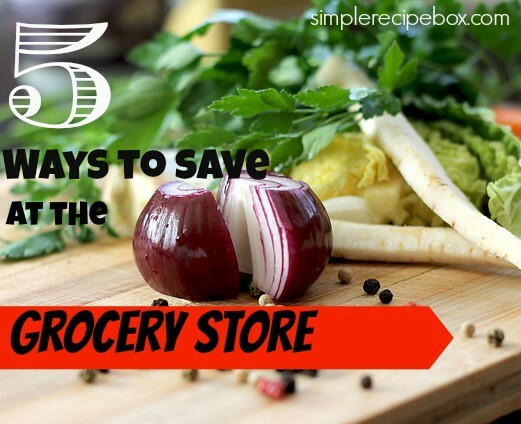 So, without further ado, here are 5 ways to save at the grocery store. Instead of baby carrots, buy whole carrots and cut them up. Not only are these higher in nutrients, but they are also significantly cheaper. Whenever the work is done for you (washing, slicing, etc) you are paying extra for the labor that was done. It really doesn’t take that much longer to wash, peel and slice whole carrots. Instead of chicken breasts, or individually packaged frozen meat, buy the whole chicken. Even if you are buying organic, this will save you money. Not only can you stretch the meat on a whole chicken for multiple meals, but you can use the bones to make a super healthy, nutrient dense bone broth. Which brings me to my next point. 2) If you can make it, don’t buy it pre-packaged. Chicken broth made from bones, onion, celery, filtered water and apple cider vinegar is SO rich and delicious. It really doesn’t compare to the stuff in the can or box. Or canned soup, YUCK!, don’t get me started on that. Now, I realize that the can and box are super convenient, and I will sometimes use them as well if I’m really in a pinch. But, if you are really wanting to slash your budget, make your own stock instead of buying it. You use the bones over and over to make weaker stock that is still useful, meaning that you get so much more bang for your buck by making your own. Also, soup made from bone broth is very filling, full of healthy fats, good for kids with growing bones, great for digestive issues… really I could go on for a long time, but I won’t. 3) If it’s convenient, it costs more – bottom line. Individually packaged yogurts and snacks are nice to have, but you will save tons by buying larger quantities and splitting them up into your own containers. Buy higher quality cheese in a block and shred it yourself (you can do this in seconds with a food processor OR use a dollar store cheese grater:), your food will even taste better. Remember, anytime the work is done for you, you’re paying for it. Really weigh out how much time you are saving compared to how much money you are spending. Also, there are typically more additives and junk in the individually packaged items, so you aren’t doing your health any favors either. Plain Greek yogurt sweetened at home with raw honey or stevia and some fruit would be a healthier choice. 4) Buy in bulk, but do it smart. Not everything bigger is better, so don’t just go crazy at the bulk buying stores. At a lot of grocery stores they will have a bulk section where you can purchase things like organic rolled oats, organic popcorn, and nuts and seeds. This is a good place to stock up because the prices are usually better than the packaged stuff. An even better option than buying from the store would be ordering online from Azure Standard, if they deliver to an area near you. If you won’t use 10lbs of oats, or 20 lbs of organic apples, find a friend who wants to split the order. With a little planning this will save you loads off of your weekly budget. We bought some organic wheat berries and rice a few years ago, so I never have to purchase those things on my weekly grocery trip and it really does add up to a lot of savings. 5) “Healthy” does not have to be all organic. Whoa, what did she just say?! And you hear all the health purists yell, “Blasphemy!”. Listen, I think most of us realize that the ideal diet for someone with the resources would be all local, all organic, all of the time, or better yet… all home grown. If you are able to do that, fantastic! But let’s be real, there are tons of people who do not have those kinds of resources (myself included). Does that mean they(we) are doomed to eat packaged food laden with preservatives and GMO’s? I don’t think so, and I’m basing this opinion on my experience of feeding my family. NOT ALL NON ORGANIC PRODUCE IS GMO!!!! I don’t know where this craziness is coming from, but I like to follow the lists from The Non-Gmo Project or Institute For Responsible Technology. Both of these sources I feel are reputable and honest without stretching the truth or being too dramatic. If you follow these lists, it doesn’t seem terribly impossible to limit your GMO intake. Hybrid produce is completely different from Genetically Modified produce, that’s a discussion for another time. Don’t believe every graphic you see on the internet. Bunny trail over. Back to point number 5: If you choose an apple over packaged/processed food, the apple IS a healthier choice. If you choose a salad made from fresh whole ingredients instead of a box, that IS a healthier choice. If you are doing the best you can to make your food from whole ingredients but you aren’t able to go all organic, it’s okay. You are doing a better job than before. Let’s not throw in the towel, let’s get back to what we considered healthy before and do the best we can with what we’ve got. I totally agree 100% on this! Great post! Well said!! I agreed with every point. I’m so glad you wrote this. What I want to know is how you have time to write your blogs with all your kiddos? Carla, I make the time. I either write in the morning or evening or write a few posts on the weekend and then release them through the week. It’s challenging, but I do love it! Hi I am reading this from my sisters fb page …I feel as though I could learn a great deal from you. Do you have a page?